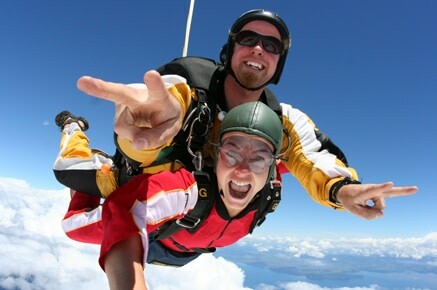 Taupo Tandem Skydiving is New Zealand's original skydiving operator and the only Qualmark endorsed drop zone in Taupo. With the widest range of camera options available and multi-lingual tandem masters, your skydive experience will be unforgettable. The adventure begins with a scenic flight above the central plateau, taking in views of the Southern Hemisphere's largest lake and snow-capped volcanoes. Exiting the plane at up to 15,000 feet, you experience the exhilaration of freefalling at 200km per hour! Catch your breath as you enjoy a spectacular parachute ride back to Earth. Remember your experience forever with one of our camera packages. Whether you prefer the unique style of our Handycam or the varied angles of our Freefall Camera, we have something for everyone. Both camera styles offer video and digital photos. Receive all of your footage on one of our new 8GB USB flash drives. The beauty of tandem skydiving is that it doesn't require any prior training. Leave it all to us we have taken over 170,000 people skydiving since 1992! You are in the capable hands of your tandem master who will ensure your safety while you experience the thrill of a lifetime. Bring your friends and family along to witness the experience. We have a cafe and free wireless Internet on site.